The Project Gutenberg eBook of Christmas Holidays at Merryvale, by Alice Hale Burnett. AUTHOR OF "HALLOWE'EN AT MERRYVALE,"
THE NEW YORK BOOK CO.
"Wish my dad would get me a new sled like that flyer," sighed Toad. Six real stories for small boys, each complete in itself, telling about the many interesting doings of "Toad" and "Chuck" Brown, and their friends, "Fat," "Reddy" and others. The books are written so the boy may read and understand them and the action faithfully portrays boy life in a small town. "Toad" and "Reddy," by good fortune, each earn two tickets to the circus, although they find watering elephants a harder task than it at first seemed. A jolly party of boys visit the circus. Dad's story is followed by an unexpected visitor who at first startles then interests all of the little party gathered around the fireside. Did you ever go to a picnic in a large farm wagon, filled with boys and girls? Then did you catch a fine lot of trout and broil them before a camp-fire? "Toad" and "Reddy" did these very things and had a day long to be remembered. Daddy Williams' Toy Shop is the center of interest to "Toad" and his friends long before Christmas arrives. They plan a surprise that brings joy to a poor family. The boys erect snow forts and the two sides have a battle royal. "Toad's" grandmother invites him and "Reddy" to spend a month in the country. Their experiences at Sunnyside farm, with its horses, cows, pigs and chickens, are most entertainingly told, and they have the time of their lives boating, swimming and fishing in the creek. For many days the boys had been looking forward to the party to be held at Toad Brown's house, but the evening finally arrived and a number of new games were played, although a few things happened which were not on the program. "Hurrah!" shouted "Reddy." "School is out and no more lessons for two weeks!" and he threw his cap into the air. "Let's go home by the way of the village, so we can look into Daddy Williams' toy shop," suggested his friend Thomas Brown, better known as "Toad," who ran up to join him. "All right," agreed Reddy, "and I'll show you what I want for Christmas," and they started down the street. "Looks as though it might snow by night," said Toad, "don't you wish there would be a big one? Then we could get all the boys together and have a battle." "It's the best fun I know of, next to swimming in the creek," was the answer. "Here we are," he cried a few minutes later and both boys stopped in front of a small shop window that looked very gay with a wonderful display of Christmas toys. "See those skates hanging up by that sled. That's the kind I want," pointed out Reddy. "You screw them right into the heels of your shoes and you bet they can't ever come off." "They're fine," agreed Toad, "but look at that engine and train. It goes right through the tunnel and up over the bridge. I wonder how fast it can run." "That's a dandy mitt there," said the other, pointing to a baseball outfit. "I wouldn't be afraid to stop any kind of a ball with that on." "Wish my dad would get me a new sled like that flyer," sighed Toad. "I finished mine last winter when I ran into that tree with you and Herbie on board." "You surely did," was the laughing answer. "I remember how we all went flying head first into a snow drift." "There's a nice pocket knife," was Toad's next remark. "I mean the one with the pearl handle, just next to that doll with the pink dress on." "Oh!" exclaimed Reddy, "here's what just suits me," catching sight, for the first time, of a punching bag. "How do you work it?" "Why, you see there's an elastic rope on each end of it, and one of them you tie to a ring in the floor and the other to something overhead. Then when you give it a punch it comes back to you with a bang." "Well, I'd rather have a football; then maybe we could get up a regular team," remarked Toad. "I'll bet all those reals would cost about ten dollars," ventured the other, pointing to a box of marbles toward the front of the window. "If I was rich I'd buy them." "What for? You have plenty. You won nearly all mine away from me. Look!" he added in a low voice, "there goes Herbie's mother into the store. Let's see what she buys." "Hello, Daddy," greeted both the boys, as old Mr. Williams, with his white hair, red cheeks and dancing blue eyes, came to the doorway of the shop and smiled at them. "Merry Christmas, Merry Christmas!" he replied. "Have you been good boys?" "I should say we have," cried Toad. "Everybody's good before Christmas." "Well, run along home then, and I'll tell your mas just what you want," promised Daddy. "Herbie's ma's in here now and she doesn't want you boys to know what she buys." "All right," answered Reddy. "Don't forget to say I want a punching bag and a pair of skates." "And I want a new sled," chimed in Toad, as they both started off. "Shucks, I didn't see half the things, did you?" protested Reddy. "Oh, well, we can come down again this afternoon," was the cheering answer. "Come on over to my house, anyway," he called as they parted. By evening the snow that Toad and Reddy had so eagerly awaited had come, and by morning many inches had fallen. 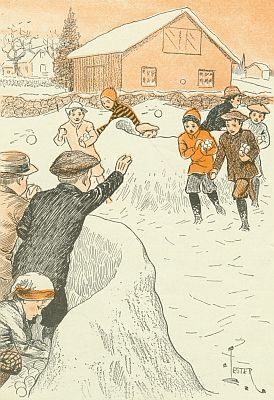 A crowd of boys had gathered on the Brown's lawn, for the news of a snow battle had carried far. "First chooser!" cried Charley Brown, a happy-faced boy who bore the name of "Chuck" among his friends. "Second," shouted Reddy, and when the sides were chosen Toad found himself with Herbie, a boy with whom he played very often, and four others on Reddy's side. "Charge!" shouted Reddy, on the run, the others close upon his heels. It was then decided by the choosers, who were also the captains, to build two forts, ten yards apart, and a half hour was agreed upon as time enough in which to do the work. "We must hurry," Reddy told the boys he had chosen, "and I think," he added in a low voice, "three of us had better build the fort while the other three make snowballs, as we want a lot on hand so we wont have to stop firing to make them. "Work fast," he ordered as he selected two of them to help him build the fort. Toad piled up great heaps of snow while Reddy and Herbie packed it down with wooden spades into a wall which curved like a new moon. "How are the snowballs getting on, boys?" asked Toad of the three boys who were working hard making them. "We're stacking them up so they'll be easy to get at," answered one. "They're good hard ones," said another. "It's fine packing snow." "We're going to have plenty, too," laughed the third. "Wonder what Fat's doing?" cried Reddy. "He's bringing a pail of water from the house." Frank, called "Fat" by the other boys, because of his size, was Reddy's older brother. "I wonder," mused Toad. "He's pouring it on the walls of their fort. Oh, don't you see," he added a moment later, "it's to make it freeze." "Let's do that too," proposed Herbie. "I'll get the water," and he started for the house. Ten minutes later the walls of the fort were like a solid mass of ice, and the snowballs were inside in four heaps so all were anxious for the fun to begin. "Hey, Captain of the enemy!" shouted Chuck from the other fort, "are you ready?" "All ready," came the answer. "Fire!" A storm of snowballs flew through the air and Reddy barely had time to duck his head as they whizzed by. "Looks as though they had plenty of balls, too," exclaimed Toad, hastily picking up an armful and running outside to get within closer range. "I don't think so," protested Herbie. "I could see all of them working on the fort. We have lots more, I'm sure." "Well," cried the Captain, "let everybody take a pile of snowballs and we'll run out together and maybe we can drive them from their fort." Each boy carried as many as he could in one arm, this leaving the other one free to throw with. "They got me, but I hit two or three of them!" "All ready!" shouted the Captain, and the others, following close on his heels, dashed out. Such a hail of snowballs met them that they halted for a moment, then dashed onward right up to the enemy's fort. "Don't waste any ammunition until you get close," ordered Reddy, and his company obeyed. "Now let her fly," he directed, as they surrounded the fort. The boys threw with a will and were vigorously answered by the defenders of the fort, and for a time it was hard to see which side would win. Finally, after the ammunition of the attacking force was used up, Captain Reddy ordered a retreat back to their own fort. "I have a better plan this time," he announced after they were safely inside. "When we charge again, two of you fellows must keep running back to our own fort so as to bring us supplies of snowballs. Then we can keep up a much longer fight and when anyone gets tired throwing," he added, "he can change places with one of the fellows that have been carrying the balls." "They're coming to charge us." 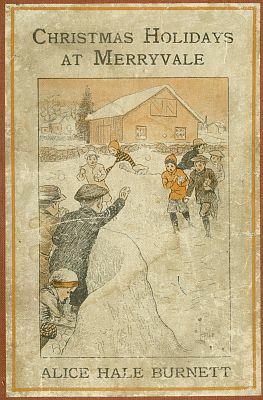 "Get ready to give it to them," ordered the Captain and each boy, snatching up an armful of snowballs, prepared to repel the attack. "Fire!" Reddy shouted, as the enemy drew near, and when they met that rain of balls it didn't take them long to get back to the cover of their own fort. "That was great!" cried Herbie. "Come on, let us charge this time before they have a chance to get ready for us." "Hey, I'm the Captain," insisted Reddy. "Nobody gives any orders but me," and he pulled his woolen cap well down over his ears in preparation for the coming attack. "Well, hurry up and give them, then!" shouted Toad. "I'm all loaded up." "Charge, charge on!" shouted Reddy, starting out on the run with the others close upon his heels, and after a few minutes of hard fighting they had forced their way to the walls of the fort. The balls were flying so thick and so fast, from both sides, that it looked like a snow storm of enormous flakes shooting in all directions. The boys carrying balls to supply the invaders were kept busy, but before long it was noticed that there were fewer coming from inside the fort. "They've used up all they have," shouted Toad. "Let's get closer." "Close in," cried Captain Reddy, "and aim well!" In another minute you could plainly tell that each of the enemy, after throwing one snowball, had to stop long enough to make another one and this was the time for which Captain Reddy had been waiting. "Charge the walls!" he ordered, and with wild cries the boys dashed forward. Up over the walls they went and once inside the victory was easily won for the boys inside the fort were empty handed and couldn't defend themselves. "We win, we win!" exclaimed Toad, throwing his hat into the air. "Three cheers for Captain Reddy!" "Hurrah!" shouted all the boys. The day before Christmas dawned bright and cold. Mother Brown, who had been up early, made some wonderful Christmas pies and a pudding before Toad and Chuck were awake. It was eight o'clock before Toad opened one eye. "What's the use of getting up," he thought, "I'm so warm and comfortable here in bed. My, but something smells awfully good. Wonder if it's breakfast." Suddenly he sat up straight in bed. "Look at that lazy thing," he declared. "Bet he'd sleep until noon if I'd let him, and with all we have to do to-day." Chuck continued to snore peacefully. "But I won't—I'll have some fun," thought Toad, as quietly, with as little noise as possible, he crept from his bed to the basin in one corner of the room. It took him only a few seconds to wet a large sponge with cold water, then, creeping very carefully back to the foot of Chuck's bed, he took careful aim. The sponge flew through the air true to its mark and landed "kersplash" on Chuck's tousled brown head. "W-w-w-what's the matter?" spluttered Chuck, sitting up and blinking his eyes. Then, as he felt the water trickling down his cheeks and caught sight of Toad, doubled up with laughter, he jumped out of bed and, running across the room, he pushed Toad flat on his back on the bed and sat upon his chest. "Let me up," pleaded Toad. "I couldn't help it, you looked so sweet." "What'll you give me if I do?" laughed Chuck. "You've got to pay for that smart trick before I let you up." "Nothing!" gasped Toad, trying very hard to free himself. "Oho!" laughed Chuck. "You won't, eh? Well," he added, "I don't mind sitting here all day. I'm real comfortable." At this moment there came a knock at the door and before either of the boys could answer Father Brown entered. "Toad hit me in the face with a wet sponge while I was asleep," explained Chuck, "and he's going to give me something for it." "Then why are you sitting on him?" asked Father. "Because he says he won't," replied Chuck with a grin. "I suppose you'll have to pay up Thomas," laughed Father. "Anyway, I hope you'll both be down to breakfast soon," he added—"before all the cakes are gone. I've a terrible appetite this morning," and with these words he left the room. "Do you give up now?" asked Chuck. "Remember what he said about the cakes. They'll be hot ones with lots of maple syrup," teased Chuck. "Well, you're missing them, too," retorted Toad. "I guess I'll let you off this time," relented Chuck, "but if you ever do it again," he threatened, "I'll hold you down for a week, cakes or no cakes." "You'd starve to death in that time," argued Toad, with a laugh as he commenced to hurry into his clothing. The boys were seated at the table, a half hour later, and had just eaten the last of the griddle cakes, when Reddy's whistle was heard. Toad, jumping up from the table, ran over to the window and beckoned to Reddy to come into the house. "What are you going to do this morning?" was Reddy's first remark as he entered the room. "We're going for Christmas greens and Dad's going to cut our tree from away up on the hillside," Toad told him, "and," he added, "we're going to take one of the horses with us to drag it home." "Oh, that's great!" replied Reddy. "Do you start soon?" "Don't you want to go, too?" asked Chuck. "And maybe we can get Fat and Herbie, too," he added. "If such a crowd goes, and everybody gathers greens," laughed Toad, "what will we ever do with all of them?" Mother Brown answered him from the doorway. "Why not take some of them to the church? I'm sure the ladies who are trimming it will be glad to use all that you can give them." "That's a splendid idea," declared Father Brown, rising from his seat by the fireplace. "Come, boys, bundle up well, because it's going to be a cold drive." "I'll run ahead to get the others," called Chuck as he hurried from the room. "I'm glad we brought the sleigh," Father Brown remarked, as they were driving along at a fair pace, a little later, "as we never could have gotten through with a wagon in this deep snow." They were now starting up the hill and the horse's feet sank deeply into the snow drifts, although his load was not heavy, as the boys took turns walking, so that only two of them were riding at a time. "When we reach the first clearing," Father proposed, "we'll cut the greens and then leave them in a pile by the roadside, for it is likely we shall have to go up still higher before we can find the tree we want." "Here's the place; all hands to work!" and the boys started in with a will, bringing to the roadside great heaps of boughs and woodvines, some of them covered with red berries and others with grey. Within a short time they had gathered a large pile of the greens, so they decided it was time to start out to find the tree. "The tree must be full and the top perfect," declared Father Brown, "so keep your eyes open for it." "What's the matter with that one?" demanded Toad, pointing to a big fir some distance away. "Nothing at all the matter with it," laughed Chuck, "only the house is too small to hold it." "There's a nice one," called out Herbie, pointing to the one he meant. "Yes, that's a beauty," agreed Father Brown, "and easy to get at, too." After clearing away the smaller branches near the ground, by chopping them off with the axe, Father Brown then started to work on the trunk of the tree. "Wouldn't it be nice," suggested Fat, "if we didn't have to cut it down at all,—just trim it outside? It would save so much time and trouble." "Oh, yes, that would be great," agreed Reddy. "We'd just sit around on the snow eating ice cream and look at the tree," and he gave a hearty laugh in which all the others joined. "Well, I'll bet they do it in Greenland and Iceland," persisted Fat, "so why couldn't we?" "Because we don't wear white Polar bear clothes," laughed Chuck. "There she comes,—she's falling!" cried the boys. "Stay where you are until it's down," called Father Brown to the boys. "There she comes! She's falling!" cried the boys. There was a sharp creak and a swish of branches as the tree came down, and the boys now rushed over to help tie up the branches. "All together! Lift her on the sled. One, two, three!" and up it went. "Nobody gets a ride home," called out Chuck, "because the greens have to go on top of the tree." "Oh!" wailed Fat, "if I can't ride I'll roll down. I hate to walk." By the time they had reached the fields the worst part of the trip was over. "We'll cut over to the road that runs past the church," said Father Brown, "and leave some of the greens there," at which the horse was headed in that direction. As they came to the road they saw a short distance from them an object in the snow and as they drew nearer it proved to be a little fellow, deep in a snow drift. His hands were blue with the cold and as Father Brown picked him up in his arms he tried to speak, but couldn't. "I know who he is," volunteered Herbie. "He's Patsy O'Reilly, and he lives over there," pointing to a small house up the road. "His brother Mike goes to school with me," he continued. "I'll carry him home," said Father, "as you boys are able to handle things all right now," saying which, he started off to the little house with Patsy in his arms. Chuck, to whom Father Brown had handed the reins now started to drive the horse toward home. When the boys arrived at the church and had carried in the greens, the ladies were delighted, and one of them even tried to kiss Reddy, but he hurried away just in time. When they reached home Chuck drove the sleigh up to the side door, where the boys quickly unloaded the greens. They then lifted the tree to the piazza and when this had been done Chuck drove the horse to the stable. "Let's go in and get our hands warm before we take in the greens," suggested Toad, and soon they were all laughing and talking before the great fire in the library. Fat had just asked the others if they remembered the day Mr. Brown had told them about the Indians that used to live in the woods where they found the tree, when a man's voice was heard from the hall. "It's going to be a sad Christmas for them, I'm afraid, for both parents are ill and the three helpless children are waiting for Santa Claus to come," the boys heard Father Brown say. "How sad," was Mrs. Brown's answer, as they both went into the kitchen and the boys could hear no more. "They must be talking about the O'Reillys," commented Fat. "Mike's a friend of mine and I'm sorry he isn't going to have any Christmas." "So am I," echoed Herbie, after a short silence. Chuck said he'd hate to awaken Christmas morning and not find any presents. "Guess I've been mighty selfish wanting so many things," he thought. Toad and Reddy, who had moved away from the other boys, were talking together in low, excited whispers. Then, when the others went to the window to look at the green outside, they slipped from the room and hurried down the hall to the kitchen. "Mother," called Toad from the doorway, "may we speak to you for a minute?" "I can only spare a few minutes to-day, Thomas, for I am very busy." "But, Mother," exclaimed Toad, "we have a great idea!" "It's a Christmas surprise party," chimed in Reddy, "for the O'Reillys," and together the two boys went on to tell Mrs. Brown of their plans. "If we could just have the horse and sleigh to get around in," ventured Toad. "Do you think Father would allow us to hitch old Meg to the big sleigh?" "It's a wonderful idea," agreed Mother Brown. "Suppose you ask him. But how about presents for the three children? Have you thought of that?" "If it were only after Christmas we could give away some of our new things," sighed Toad. "But would you give them away?" asked his mother. "Supposing you were going to get a sled,—the kind you have been wanting," and she paused to hear Toad's answer. "Yes, because I always get a lot of things and it might be the only present Mike would get." "Well," remarked his mother, "I have bought you a sled, and you may give it to him." Reddy looked at Toad, as Mother Brown turned toward the kitchen. "Are you sorry now that you said 'yes'?" he asked. "No, I'm not," returned Toad. "Well, I'll ask Mother to let me give them something new of mine, too," declared Reddy consolingly, putting his arm about Toad's shoulder. At two o'clock the sleigh was ready, for Father Brown had willingly given the boys permission to use it that afternoon. It was planned to have Chuck drive, for Toad, Reddy, Fat and Herbie expected to be too busy calling at the different houses to gather the presents which they hoped to collect for the O'Reillys. "Let's stop at Bailey's first," suggested Fat, "as we're sure to get something there." "Who'll go to the door?" questioned Herbie. "All go," answered Chuck. "That's the best way." So in a group they rang the bell and waited, Chuck remaining in the sleigh. No one came in answer to their ring. "All out," sighed Fat; but Toad gave the bell another pull. "Bet they're all in the kitchen baking things and didn't hear it," he remarked. "Good afternoon," said all the boys in chorus. "Yes, Mrs. Bailey, that explains everything," Reddy told her. "In one little home there may be no Christmas cheer; the father and mother are both ill. There are three children; a boy of nine years, another of five, and a girl of seven. They need coal, clothing, food and toys. What will you give?" "So you're all playing at being Santa Claus," remarked Mrs. Bailey with a smile. "Well, I believe I can find something that will please you, so just stop in on your way back and I'll have it all ready for you." "Oh, thank you!" cried all the boys, together, as they started for the sleigh, happy over the success of their first call. "Have any luck?" asked Chuck. "But I can see you did, because you're all grinning," he added, as they told him what Mrs. Bailey had promised. After several more visits, with the promise of something from each place if they would call later, Herbie proposed that they stop at Mrs. Lee's home, as Mary Lee had a great many dolls and might give them one of them for the little O'Reilly girl. "That's a good idea," they all agreed, and the idea was carried out. When Mrs. Lee had read the card she asked the boys if there was anything they needed that had not been promised. "We wondered," replied Herbie, "if Mary would give us a doll for that little girl?" "I think I can promise you that she will. If you will call later it will give me a chance to get her." "We'll be glad to," promised the boys, "and thank you." At five o'clock a sleigh piled high with bundles and boys was seen turning into the Brown's driveway. "What'll we do now?" asked Toad of the others. "Let's drive into the barn and leave the things in the sleigh," suggested Chuck; "then we can meet here early tonight and take the things to the O'Reillys." "All right," assented the others. "What time shall we meet?" "At seven o'clock," said Toad. After dinner that night Chuck and Toad spent a little time helping to trim the big tree that had been put in place in the library during their absence of the afternoon. Chuck was on the top of a stepladder, tying shiny colored balls to the upper branches, when Toad, who had been busy with candy canes and popcorn balls, suddenly stopped and looked at the clock on the mantel. "It's seven o'clock, Chuck," he cried, "and the others will be wondering why we don't come out," and at this he ran into the hall to get into his coat and cap. Chuck took but a second to follow Toad out into the yard to meet the boys. Mother Brown had sent her bundle and Toad's new sled to the barn by John, the stableman, who put them into the sleigh with the other things while the boys were at dinner. "Hello, boys! Everybody here?" inquired Toad as he joined the group of boys in front of the barn. "All but Fat," laughed Reddy, "and he'll be along in a minute. He said I walked too fast for him." "Is everything in the sleigh?" asked Herbie, as John was hitching up. "Everything's in all right," Toad assured him. When about to start they found that the sleigh was so full of bundles that some of the boys had to stand on the runners. Just as they reached the street, Fat was seen coming toward them. "Hurry up, lazy bones," called Reddy, "or you'll get left," but John good-naturedly stopped the horse until Fat had climbed aboard. There was a full moon and the sky was bright with stars. The snow was hard beneath the horse's feet, which made the going easy, so they traveled along at a brisk pace. "Where shall I stop?" asked John as they drew near the O'Reilly's cottage. "Just a little this side of the house," directed Toad, "so they won't hear us." "All off, now," ordered Reddy, as John pulled up the horse, "and help unload. Don't let's make any more noise than we can help." "We can pile everything on the front steps," whispered Herbie, as the boys, each heavily laden with packages of all sizes and shapes, walked very quietly up the path toward the house. Each carefully placed his bundles or boxes where Herbie had suggested and just as silently they now returned to the sleigh. "Suppose someone comes along and takes all the things before they get up in the morning?" argued Fat. "I don't think it's safe to leave them there all night, do you?" "Well, maybe we'd better throw some snowballs at the door," proposed Chuck, "to bring them out now." This was accepted as a good plan, and "Bang, bang, bang!" went the balls against the door. 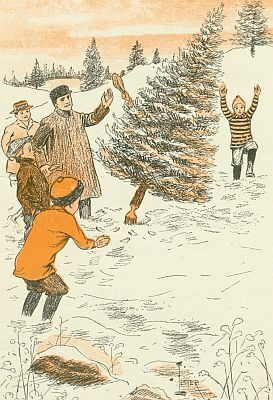 The sleigh, in which the boys took refuge, was well hidden behind a pine tree, so they could not be seen from the house. 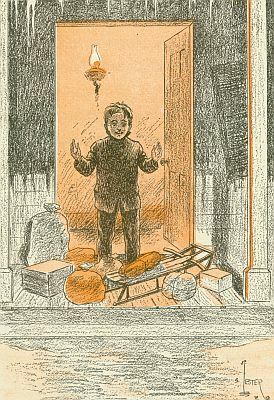 Framed in the doorway stood a boy gazing at a heap of bundles. "There's a light!" said Reddy in a low voice. "Someone is opening the door." "It's Mike!" answered Herbie, excitedly. "I'll bet he can't believe his eyes." It did seem to the others that what Herbie said was true, for, framed in the doorway of the cottage stood a boy, gazing at a great heap of bundles and boxes on the steps before him as if dazed. Once he rubbed his eyes as if to make sure he was awake, then he slowly stretched out one hand toward the beautiful new sled, hardly daring to believe it was real. Then suddenly, as the boys watched eagerly, the sled was in his arms and he was jumping up and down with joy, calling to those of his family who could, to come out to see the wonderful surprise. By nine o'clock Chuck and Toad were sound asleep, and the stockings, tied to the end of each bed, fell limp and empty. "Merry Christmas! Merry Christmas!" shouted Toad. It was seven o'clock and Chuck awoke with a start and looked around him. "Merry Christmas," he answered, and both boys scrambled down to the foot of their beds to untie the stockings full to overflowing with candies, nuts, oranges and many small gifts. "Oh!" cried Chuck, "see what I have," holding his stocking up by the foot and shaking the contents out on the bed. "A big knife, and a top, and some reals." "So have I! By jinks, I'm glad to get the knife,—it's a beauty, three blades!" Chuck, who by this time had a whole candy apple in his mouth, could only nod his head in reply. "Let's hurry up and dress so we can go down to see the tree," proposed Toad. "I'll bet there will be lots more things for us down there," and this the boys hastened to do. 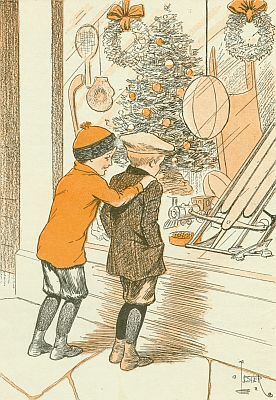 "Merry Christmas," greeted Mother Brown, a few minutes later, as the boys, now fully dressed, came to her door. "Merry Christmas, boys," called their father from the hall below, as Mother Brown and the boys hurried downstairs. As they entered the library the very first thing that met Toad's eyes was a beautiful new sled, much larger than the one he had given the night before to Michael O'Reilly. "Oh, is that for me?" he cried in delight as he pounced upon it. "I didn't expect to get one." "Yes, my son," answered his father, "it is for you." "Oh, wait until Reddy sees this!" and Toad fairly hopped about in his delight. Chuck was very much excited over a new building game, the very thing he had hoped for, but Toad hardly had time to look at his other gifts from his many aunts and uncles, so anxious was he to go out doors to try his new sled. After breakfast Mother Brown helped him into his coat and found his mittens and cap, for they always seemed to run away and hide while Toad slept. "Come on, Chuck!" he cried. "Aren't you coming out?" "Nope, I'm going to see if I can build a derrick," was the reply, so Toad started off alone. As he reached the hill down which most of the boys liked best to coast, he met Reddy, trudging along with his sled. "Hey, Merry Christmas," he shouted. "Look at what Dad gave me!" "Merry Christmas," answered Reddy. "Jingoes, that's a beauty!" "Did you get the football you wanted?" he was asked. "You bet I did, and a punching bag, too." "Like the one in Daddy Williams' window?" inquired Toad. "Just like it, and when you give it a punch, whack! it comes back at you, quick as a flash." "Oh, a lot of books and a pair of ice skates," replied Reddy, "so he's gone over to White's pond to try them." "Chuck got his building game; you know, the one he wanted, and he wouldn't come out," declared Toad in fine disgust. "He's making things with it." "Who's that just starting?" and Reddy pointed up the long hill where some one was getting ready to coast down. "Well, if it isn't Mike O'Reilly!" he exclaimed,—"here ahead of us." Then, as the sled with Mike lying flat on it shot past them, they greeted him with a shout. "Hello," returned Mike, his face all aglow with joy, "look at what I got for Christmas." "Bet you're glad now that you gave it to him," said Reddy as the two boys reached the top of the hill. "Let me go down with you the first trip?" "Merry Christmas," Reddy shouted, giving the sled a push from behind. "One, two, three, we're off," and down they flew. "She's speedy, all right," he declared as the cold north wind stung his cheeks. "And she steers like a bird," echoed Toad. Four delightful books for the smaller girls, each a complete story in itself, describing in simple language the interesting experiences of Beth, Mary and Jerry, three little maids of Merryvale. The three girls take part in a very formal little affair on the lawn of Beth's home. Each of the guests receives a present in the shape of a downy white kitten. The drive home in Beth's pony cart furnishes a few exciting moments, but Patsy bravely comes to the rescue. The girls are taken to the fair in a motor, but a slight delay occurs on the way. How they finally arrived at the fair ground and their amusing experiences are most entertainingly told. Geraldine, whom of course we know better as Jerry, plays the part of hostess to her many friends, although it must be admitted that her guests knew of the affair before she did. A jolly evening is spent by the girls which is shared in by some of our young Merryvale boy friends. Mary entertains the club at her home, and the efforts of some of the members cause many outbursts of merriment. The girls decide to hold a "fair of all nations" for the benefit of the Merryvale Day Nursery. Their many friends aid them and their plans succeed beyond their expectations. Transcriber's Note: Obvious punctuation errors were repaired.